The Daqtagh is the preferred personal knife of the Klingon warrior. It is compact and quite deadly in the hands of the trained Klingon. Over the years several variations of the knife have been seen - smaller primary blade with complex fore-guard area and spring operated secondary blades that act as guards, a larger bladed version with simpler fore-guard and spring operated secondary blades and a version similar to the second type in all respects except the secondary blades are *fixed* in the open position and do not retract. The knife is 16 inches overall in length with a 9 inch primary blade. All blade parts are a quarter inch in thickness and the handle is a polymer material that matches the fore-guard in all respects except for it's color. The meqleH is a smaller weapon that lends itself to warriors with quick hands. It is also ideal for tight shipboard fighting.This meqleH is designed for a full sized warrior. It is a quarter inch thick and 20 inches long. It has a hidden tang covered in hardened animal skin washers with a solid threaded pommel. The hidden tang allows for the sculpting of the handle to comfortably fit the warrior's hand. 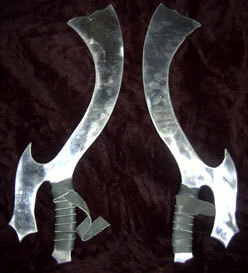 The 'aqleH is the traditional weapon of the Klingon Clerics on Boreth. It is a very ancient design dating back to the days of the early Empire. This weapon has a shaft of hardened wood 50 inches long with an additional 12 inches of hardened animal skin as an end grip. It is capped with a solid threaded pommel. The blade is quarter inch thick and is 24 inches long. All of the edges are beveled for cutting with the exception of the oval cut-outs. The overall length of the weapon is 71.5 inches long. It is suprisingly easy to handle and an excellent weapon against mounted enemies in open field situations. The use of the terminology *ghIntaq* or *Battle Spear* covers a broad variety of spear-like weapons. ghIntaq many times refers to a ceremonial weapon (Okrand's "Klingon for the Galactic Traveler") but it also a common battlefield weapon (although with more ancient origins). Pole weapons such as the ghIntaq would not be as adaptable to shipboard use and would primarily be seen on planetary battlefields. This particular weapon is 72 inches long (57 inch tIH (shaft) and 15 inch QIn (spearhead). The weapon does not lend itself to detailed photography so the spear head and the Dragon Pommel are pictured separately in close up. The Dragon head is for ceremonial purposes and indicates the close relationship of the House of Toragh with the House Kasara. This head can be removed and replaced with a blunt pommel and become a field weapon. Closer examination of the QIn shows that it has both multiple *points* and a barbed edge so that it could fall into either the category of QIn vagh or SeDveq. Close study of the subject of Klingon spears shows a tremendous variety of shapes and sizes and for this reason I prefer to use *ghIntaq* when speaking of any spear with multiple shapes and edges. The Sword of Kahless is the original bat'leth. Kahless received the design of this revolutionary blade in a dream before his final confrontation and victory over the Tyrant Molar. As the battlegrounds of the Empire moved from the ground to deep space, the design of the batleth changed to accomodate new fighting needs. 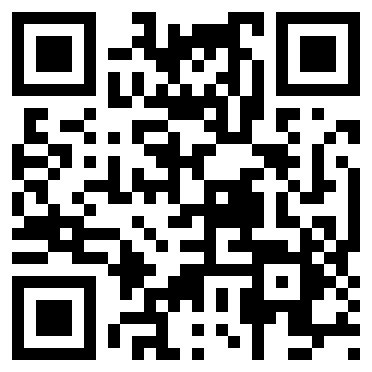 A good weapons maker must always be aware of the needs of the warrior. This blade is true to the dimensions of the original Sword of Kahless in both the *historical* and technical aspects. The titanium allows it to be made with a true Klingon thickness for the proper *heft* and it also produces it's own unique finish. The sword has been polished to a 300 grit and heat treated to shades of deep blue. The engravings are of ancient origin and appear on the original weapon.